As political pressure builds over the killing and dismemberment of journalist Jamal Khashoggi at the hands of the Saudi state, President Donald Trump has continued to shine an unwelcome spotlight on U.S. weapons manufacturers as he seeks to justify an increasingly controversial U.S.-Saudi military alliance. The statement closely followed a Washington Post report that the CIA had concluded that Crown Prince Mohammed bin Salman ordered the assassination of Khashoggi, a U.S. resident and Washington Post contributor, contradicting the Saudi government’s earlier claims. While the president’s statement noted that “the crime against Jamal Khashoggi was a terrible one,” it was focused primarily on the economic benefits of Saudi defense spending, as well as Iran’s role in supporting terrorists. Those presidential mentions have been met with consternation across the defense industry, with representatives from prominent manufacturers and trade associations preferring to stay silent. 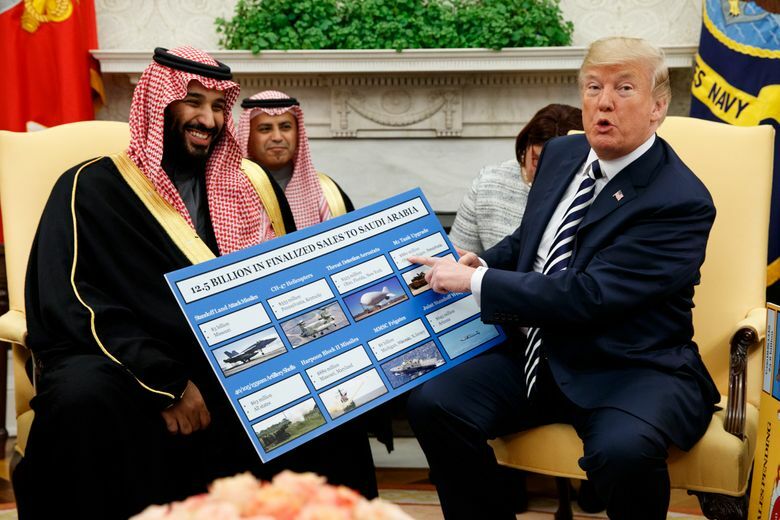 In a little over a month, Saudi business has been transformed from a badge of honor to an untouchable point of contention for U.S. defense contractors. Defense industry executives, analysts, consultants and lobbyists contacted by The Post – most of whom spoke on the condition of anonymity because they thought publicly discussing the issue would be bad for business – said the president’s repeated references to defense industry job creation in the context of Khashoggi’s killing have not been helpful. Defense executives have told investors they will honor existing Saudi contracts and defer to the U.S. government regarding arms sales to the kingdom, without mentioning Khashoggi’s killing publicly. Raytheon chief executive Thomas Kennedy, for example, said in a call with investors that his company has consistently weathered different “periods of uncertainty” in Saudi Arabia for the last 50 years by remaining “locked in step behind” the U.S. administration. Executives say they have long considered the risk that the Saudi regime’s poor human rights record could become a problem for U.S. defense industry, but are waiting to see how the situation plays out before publicly broadcasting their intentions. Defense lobbyists are closely watching the U.S. Congress, where a bipartisan group of lawmakers are hoping to curtail sales to the Kingdom in response to the Khashoggi killing. In a recent interview, Sen. Rand Paul, R-Ky., repeatedly sought to cut off weapons sales. Last year, he and his allies were four votes short, and he vowed to fight the next deal that comes before the Senate Foreign Relations Committee. U.S. defense contractors “are really in a duck-and-cover mode, hoping to tie themselves to this as little as possible,” said a prominent defense executive. “To say that we’re going to support this because we have a few thousand jobs at stake… we don’t want that,” the person said.